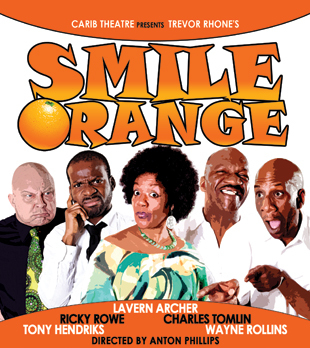 Smile Orange, the hilarious Jamaican comedy is coming to the Broadway Theatre, Catford. This popular and well loved Jamaican comedy is widely known because of the cult film made by it’s writer Trevor Rhone. Workers at the Mocho Beach Hotel prepare themselves for the bustle, and especially the hustling at the start of the tourist season. The chaotic events such as the life-guard who can’t swim, and teaching the new boy how to be a waiter, has been a rich source of comedy for all who have ever seen Smile Orange. The cast is headed by Charles Tomlin as Ringo, “I know I am a scamp, how else I going to survive?” Other cast members are Lavern Archer, Tony Hendriks, Ricky Rowe and Wayne Rollins, all well known on the theatre circuit for their very funny portrayal of Jamaican characters. The play is directed by Anton Phillips who is responsible for the West End production of The Amen Corner, and a number of plays staring Oliver Samuels.